The marvellous spatuletail hummingbird exhibits one of the most extreme courtship rituals (see video below). The male bird has two elongated tail feathers that end in a large violet-blue disc, or spatule. The male bird hovers in the air, waving his spatules in front of the female and making a snapping sound with his beak. To the hummingbird, which is the size of a ping-pong ball, this display costs a lot of energy. Spectators of this courtship ritual have reported that after he’s done dancing, the male will have to flop down on a branch, exhausted, and sit still for over an hour to regain his strength. This species of bird is rare and endangered, and lives in only a few places in Peru. 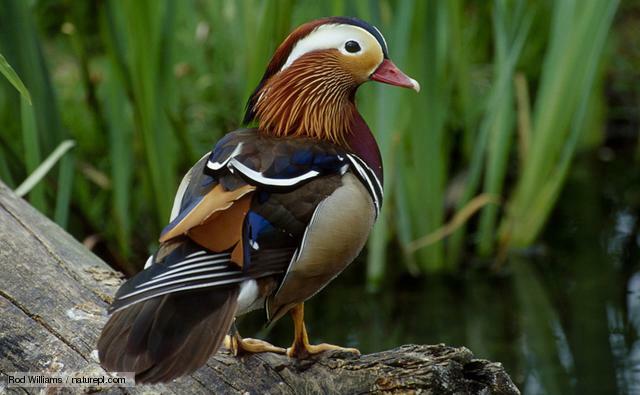 Mandarin ducks, both male and female, bob in and out of the water to seal their partnership, which is for life. In Chinese culture these monogamous ducks symbolize love, marital fidelity and relationship respect. The white-throated bee-eater is a rakishly plumed bird that engages in the “butterfly display,” in which the male and female both hold out their wings while calling to each other.